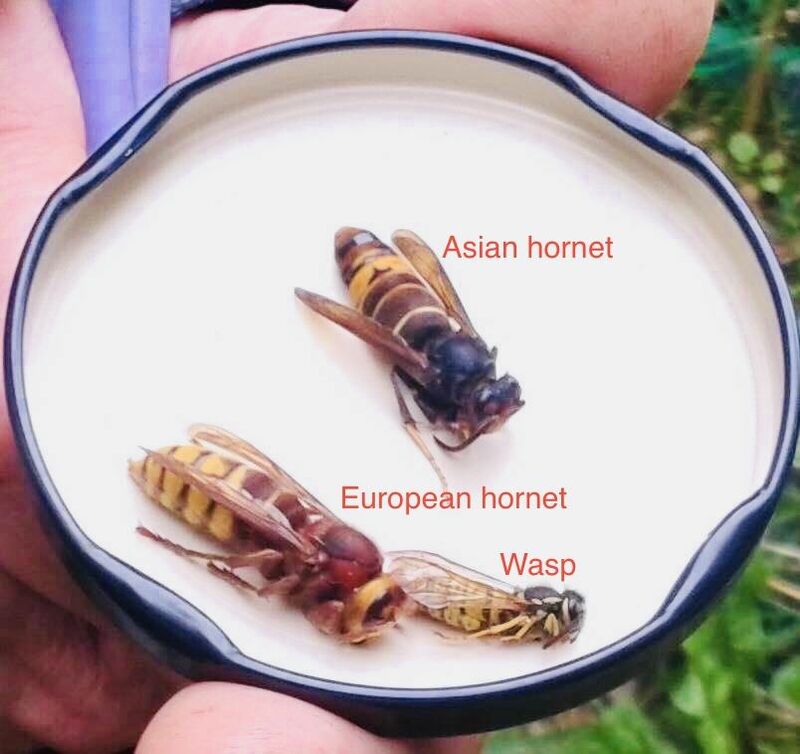 Asian hornets (Vespa velutina nigrithorax) cause significant environmental damage and sightings should be reported to the Non-Native Species Secretariat (NNSS) as soon as you can. Asian hornets are most active between April and November (peaking in August/September) and are inactive over the winter. If they get established in the UK it is predicted they will have a devastating impact on our insect population and ecosystem. A number of sightings have been recorded in the UK since 2016 and we fear numbers will inevitably increase. In Jersey, France and large areas of Western Europe they are stripping the environment bare of insects including managed honeybee colonies. If you have connections with local gardening groups, garden centres, wildlife groups and trusts etc, please spread the word. The Non Native Species Secretariat is offering a series of resources free of charge including posters and identification sheets which you can distribute to others. Take some photos and/or capture a specimen and send them to the NNSS for identification; if the sighting is positive, the NNSS will trigger further investigations by our bee inspectors. SBKA has set up an Asian Hornet Action Team (AHAT) led by Lynne Ingram. Our AHAT is county-wide comprising of at least one member from each Division. The full list is below. 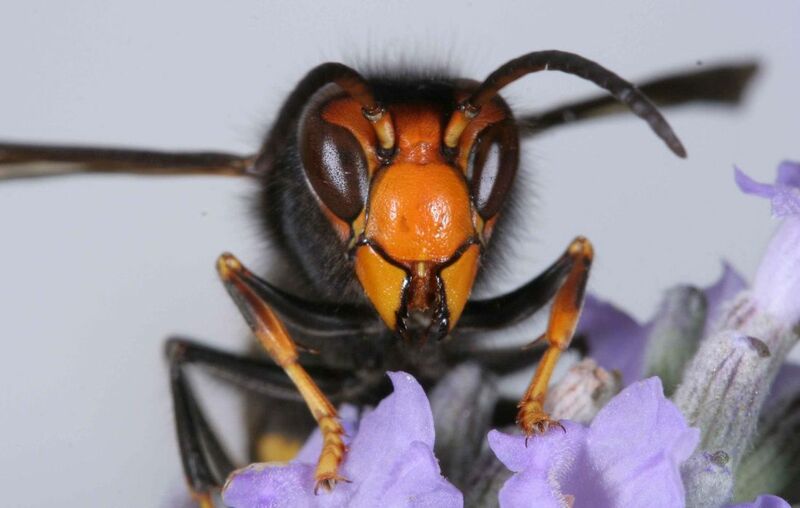 Images of Asian hornets to download are available on our image gallery. Asian hornets are rather like large black wasps with a single yellow band, orange face and yellow tipped legs. Queens are up to 30mm long, workers up to 25mm. Asian hornets are easiest to see around flowers and bee hives in late summer and early autumn. Nests can be high up in deciduous trees, in hedges and in buildings. What are Somerset Beekeepers doing? We have set up a county-wide Asian Hornet Action Team comprising beekeepers from all of our 12 Divisions. We are working with organic national dairy company Yeo Valley to raise awareness among their customers and staff. We are distributing more leaflets and identification cards to all members with the 2019 Year Book. We support the work of Dr Pete Kennedy and his colleagues at the University of Exeter who recently published a research paper showing how Asian hornet nests can be found by radio-tracking. We continue to raise awareness of the threat Asian hornets pose to honeybees, other insects and the environment with the media, public, Somerset’s MPs and councils. To download a PDF of our Asian hornet ID cards and fliers, click the files below. The NBU recommends DIY traps; alternatively traps are available to purchase from beekeeper equipment suppliers. It's recommended that you observe activity carefully around your hives especially in the autumn. The National Bee Unit has added a new feature to BeeBase to help understand UK Asian hornet surveillance. BBC Somerset invited us to talk about our AHAT on Claire Carter's breakfast show in February, 2019. In 2018, BBC covered Lynne's trip to Jersey when she joined beekeepers, volunteers and academics to track Asian hornets. Bee Craft hosted an Asian hornet special webinar in September 2018 which is well worth a watch. It featured ​Colin Lodge (who set up the AHAT website), Gerry Stuart (who has helped to track Asian hornets in Jersey), and Kevin Baughen (who copes with Asian hornets on a daily basis in France).